Several articles are stating that the California almond crop is doing alright despite the drought. Yet a few months ago stories were rife of almond growers dozing their trees because their was no way to keep them alive on 40% of the water that they need to produce. I would truly love it if some almond growers could tell me how it is really going for them in California. One report states that the total cost of the drought to the state was just over $800 million. Other figures place the cost at $2.2 million. California has a huge share of US produce. If you have been marveling over the increased costs at the grocery store, the drought in CA may be a large part of that cost increase. California grows a mind-boggling amount of the nation’s produce: 99 percent of artichokes, 97 percent of kiwis, 97 percent of plums, 95 percent of celery, and on and on. That’s why the record-breaking drought (yes, it’s finally raining—no, it won’t help much!) can affect your grocery bill, even if you live nowhere near California. 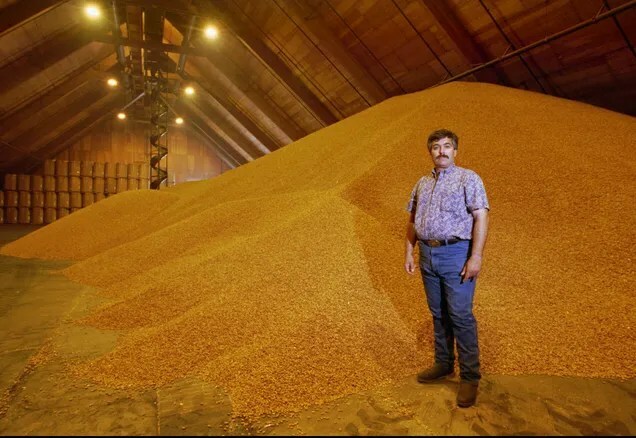 But with almonds—the state’s most lucrative agricultural export—the effect could reverberate for years. Sure, almond milk lattes and almond butter could get more painful on your health-conscious wallet, but California’s thirsty almond trees also reveal a bigger fight over water in an increasingly thirsty state. California now grows 80 percent of the world’s almonds. The almond trade has become so lucrative that we’re growing them in the desert—and that, unsurprisingly, has come back to haunt us. The fact is that almonds are especially ill-equipped to make it through drought. Farmers are already making the difficult decision to let fields lie fallow this year to conserve water. 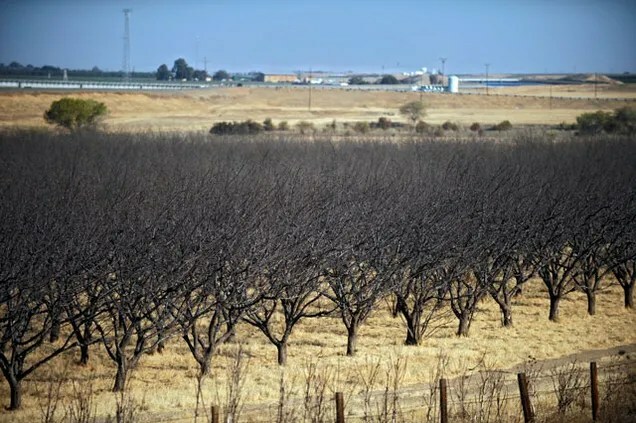 With crops like tomatoes and cotton, they could start planting again next season, but almond trees take years to mature before they bear nuts. Bulldozing an almond tree would be devastating for a farmer for years. And it’s already happening as the drought chokes up the area’s water supply. The forces that led to California’s almond trade are much larger than poor planning from any individual farmer, and Joaquin Palomino’s recent piece in the East Bay Express does an excellent job of chronicling them. In one particular corner of the Central Valley, called the Westlands, irrigation has transformed desert into bountiful farmland. 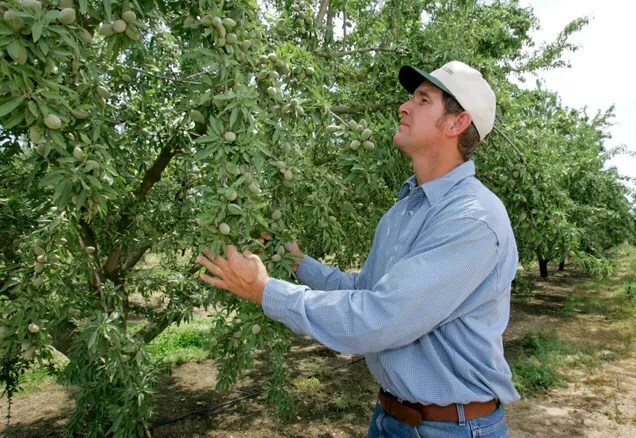 Improved irrigation techniques have also been touted for increasing almond yields—all to go along with the world’s rising almond demand. On the face of it, this seems like a miraculous triumph of technology. But it hasn’t changed the fact it’s in the middle of desert. “It’s really an area that should have never been farmed,” Richard Walker, a retired UC Berkeley geography professor, told the Express. And especially not farmed with almonds. Even with the more efficient irrigation techniques, almond trees still use about twice as much water as cotton and tomatoes. As devastating as the current drought is in the short-term, it leads us to a crossroad. Farmers tending to mature almond trees have little incentive to switch to another crop—unless they are forced to by tree-killing drought. The future of farming in Westlands also depends on the controversial Bay Delta Conservation Plan, which would upgrade the system bringing water from the Sacramento-San Joaquin Delta for irrigation. The 34,000-page plan is currently up for public comment. pay a visit this blog, Keep up the nice work.